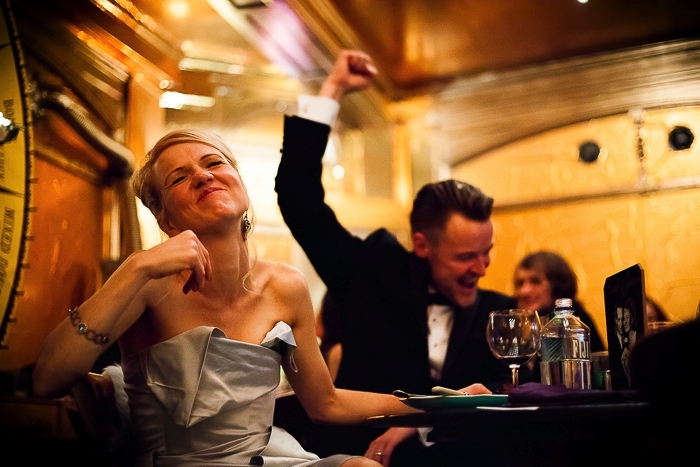 It’s not always enough to invite your guests to your wedding. 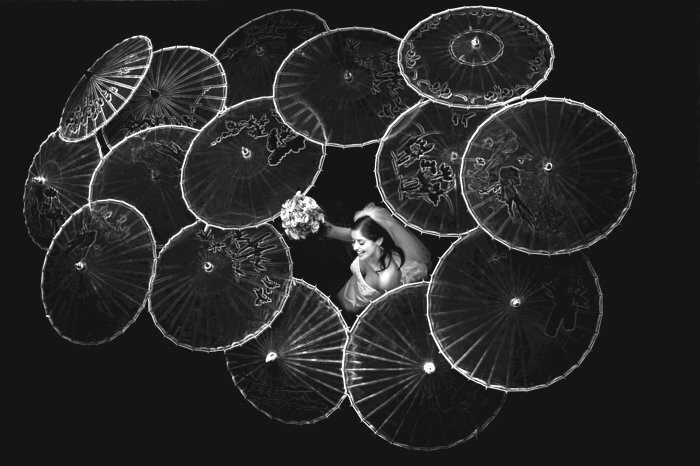 These days weddings are complicated affairs. It’s become quite normal to have many guests travelling from far removed places both from within this country and abroad. Simply inviting your guests with an address for the ceremony and venue can leave your guests with many questions. I think it’s especially good to point out that if you can party past midnight as so many venues don’t let you. 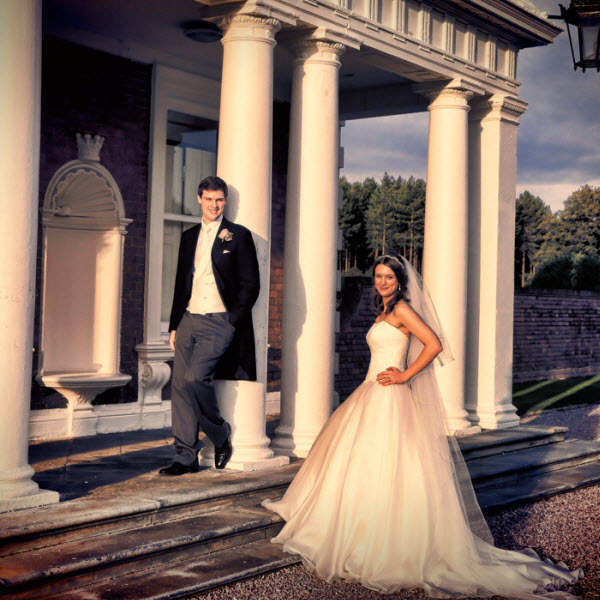 You need to tell your guests the date by which you need to know if they are able to come, together with any other information you need from them – this could include confirming names, menu choices etc.. They will also need to know when to RSVP by, who to and how. Some people include self-addressed RSVP cards with their invitations. If you expect people to send their own card then you need to give them an address to send it to. Other people gather RSVPs by email or text. Whatever makes your life simplest. 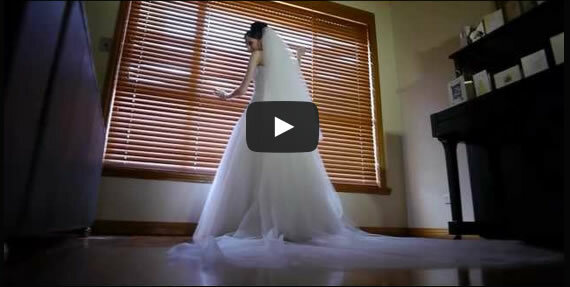 When the invite is coming from the Bride’s parents the RSVP’s will normally go to them. Sometimes a friend or relative who is helping out may also receive them. If your wedding has a choice of food which must be made in advance then it’s a good idea to give your guests the choices in their invitation and then include an RSVP which allows guests to record their choices. If your wedding doesn’t have any menu choices you may still want to gather information on who needs vegetarian food and who has any other special dietary requirements. Maps are not essential but within a few seconds they can give your guests an accurate lay of the land which might take them time to discover for themselves plus they can look good and break up the text. 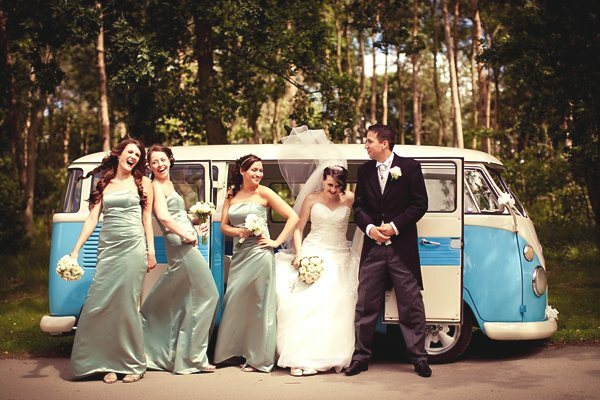 Let your guests know about accommodation at the venue and other places nearby. Local taxi companies’ telephone numbers are useful to include so your guests can plan their transport at the end of night. 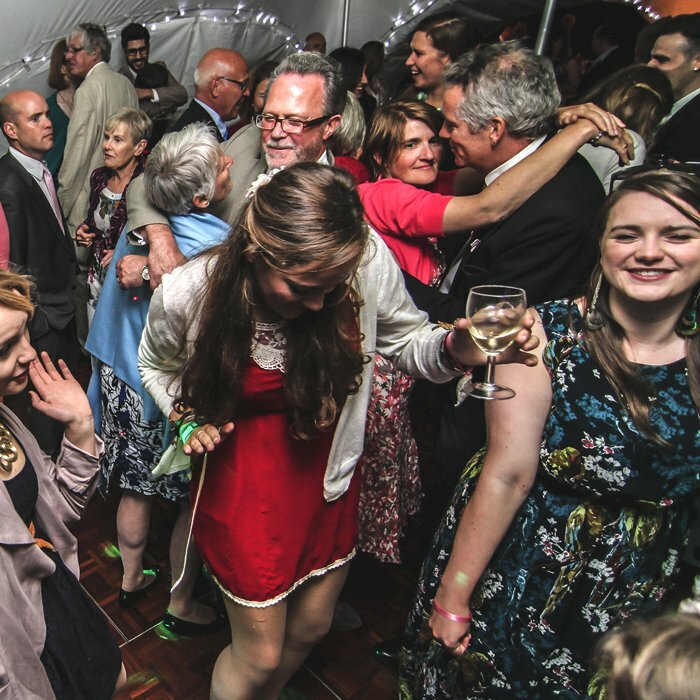 A contentious one, strict etiquette says you shouldn’t mention anything to do with gifts in the invitation as this is implies they are required in return for their attendance. The flip side of this is most people will want to bring a gift. Etiquette then has guests contact the parents who will give accurate details of the gift list or items you would like. Most of your guests will prefer if you are honest about what you would like or need for your home. Close family and friends will (hopefully) want to give you gifts which they know you will find useful or treasure. The final thing to consider is whether to ask for money. There are a lot of rhymes which make this sound more polite than saying ‘Gifts: cash or cheques only’. People do realise that many people live together before the wedding so aren’t suddenly in need of equipping a whole house. Vouchers can be a way around this. Only you can decide whether your guests will appreciate you making it easy for them to know what to get you, if they afford a gift or if it will put their noses out. 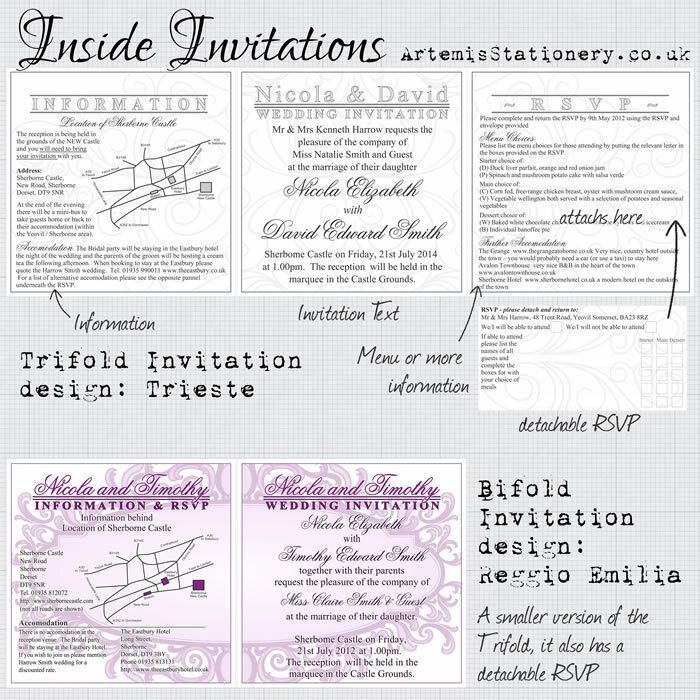 Three types of our wedding invitations are great for having plenty of space to inform your guests of all your details. 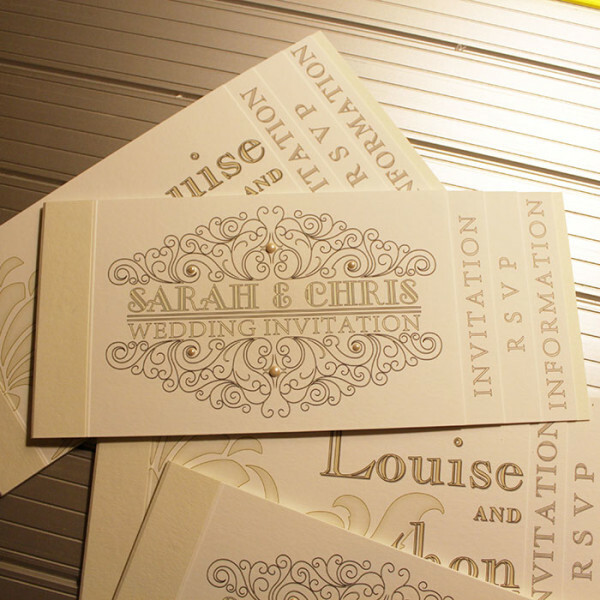 All of our invitations are handmade by Artemis Stationery in the UK for a really great quality finish. 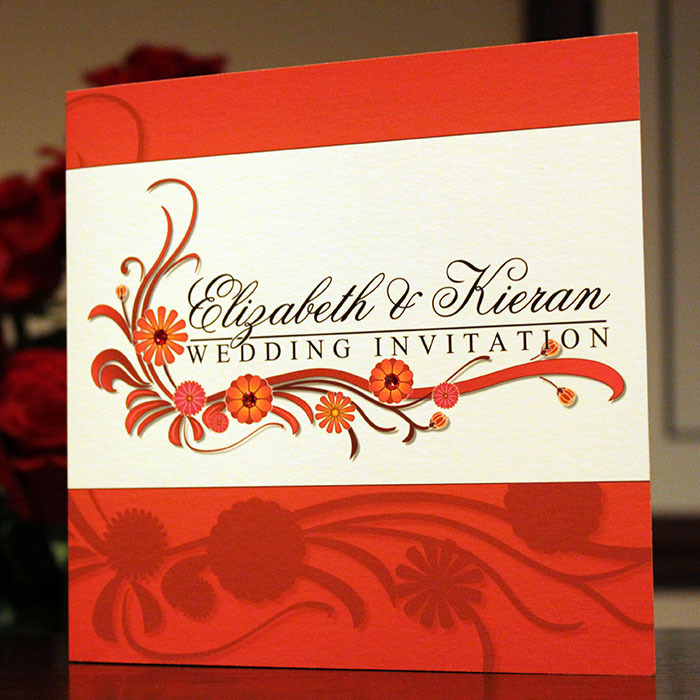 The first of these is the booklet invitation, a perfect combination of style, form and function. They feature 4 pages including the cover. The booklet invitations have a tabbed design, the pages are incrementally longer so that each page has its title visible from the front. 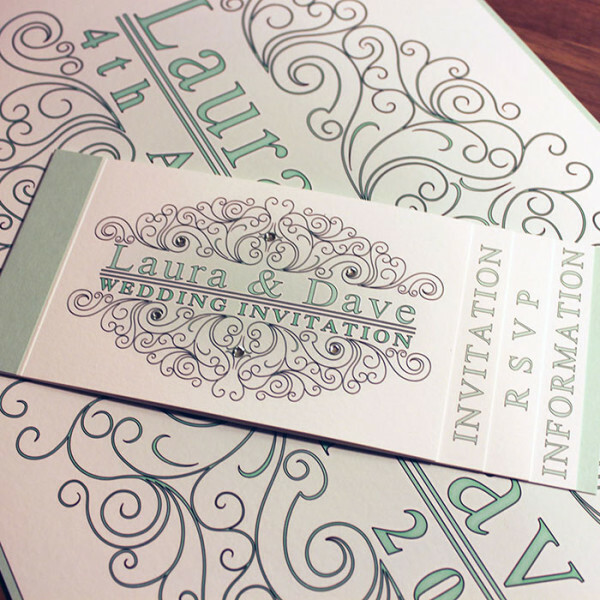 This makes the whole invite part of the presentation, all one harmonious design. A small and compact invitation it packs a lot of style and information within. If our booklet invitations are neat and perfectly formed then Trifold Invitations are our show stoppers. Definitely not run of the mill invitations. 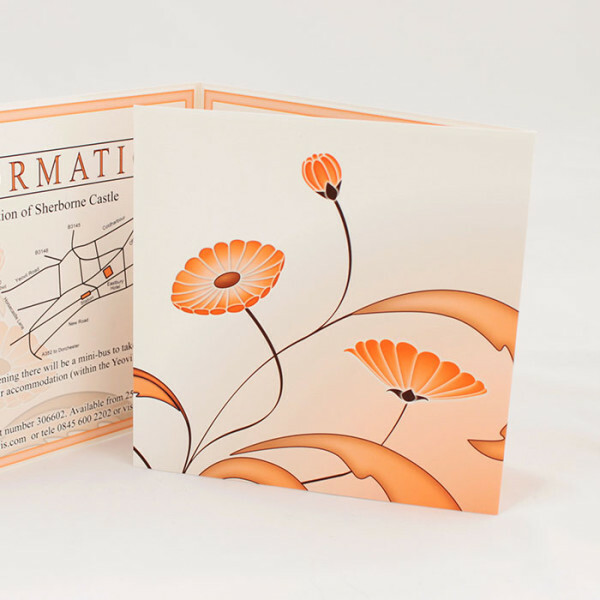 The main part of the Trifold invitation has six panels, 2 outside (front and rear cover). 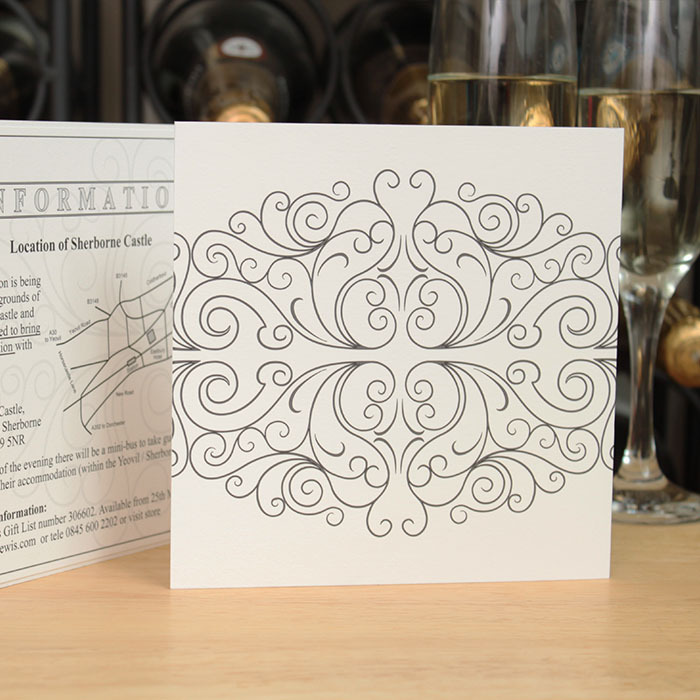 Then, when you open the front there is an intermediate panel which we use to display part of the design which is tailor-made for you, this adds an extra chance to show off the style of your wedding. Then you get to the inside. There are 3 internal panels, the invitation sits in the middle, information such as location and accommodation can go on one side and a detachable rsvp on the other. We also make Bifold invitations which are a smaller version of the Trifold. 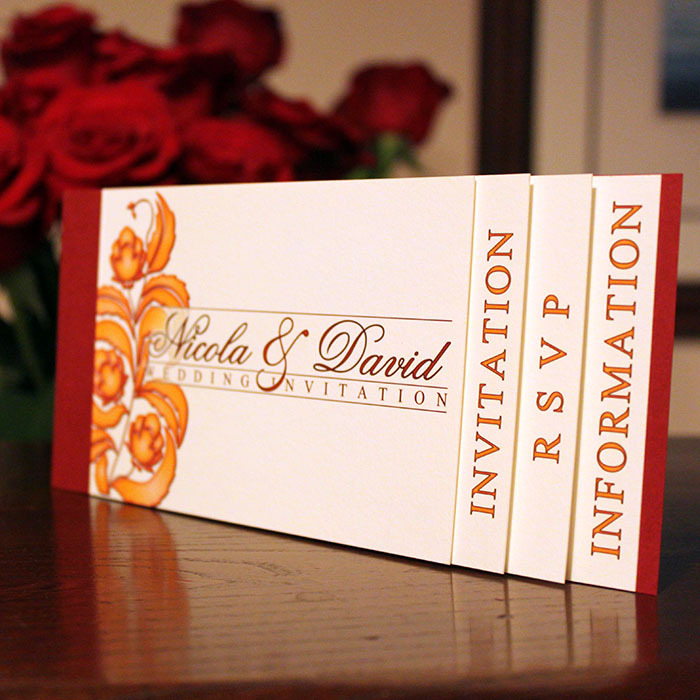 Both of our Bifold and Trifold invitations can be made into pocket folds by replacing the detachable rsvp with a pocket. 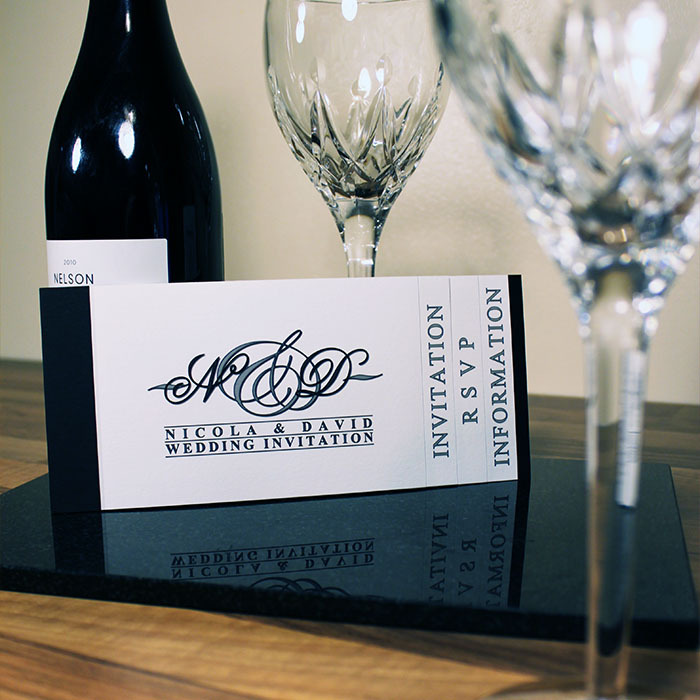 So be sure to visit Artemis Stationery if you after an invitation which makes a great visual impact but also can accommodate lots of practical information and includes an RSVP. Our invitations range from the totally bespoke invitations to those which are tailored to your occasion from one of our stationery ranges. 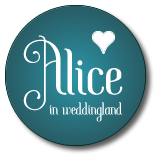 Our blog AS Invites also has lots of practical information, tips and resources for helping plan your wedding stationery and invitations. Artemis Stationery hand make exceptional stationery! 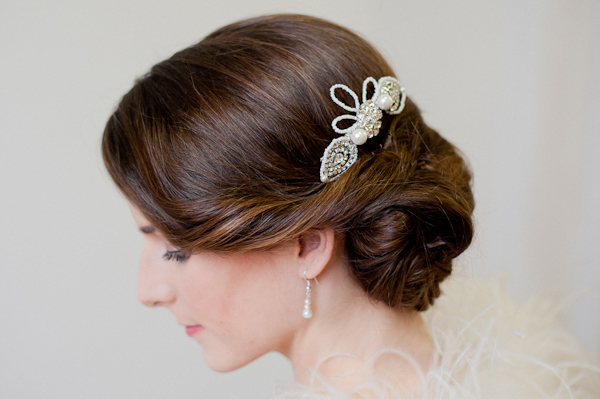 Every product we sell is as unique as each of our wonderful clients. We can either begin with a blank canvas or use one of our unique stationery ranges and tailor it to suit yourselves and your wedding creating a special and unique product that doesn’t cost the earth. 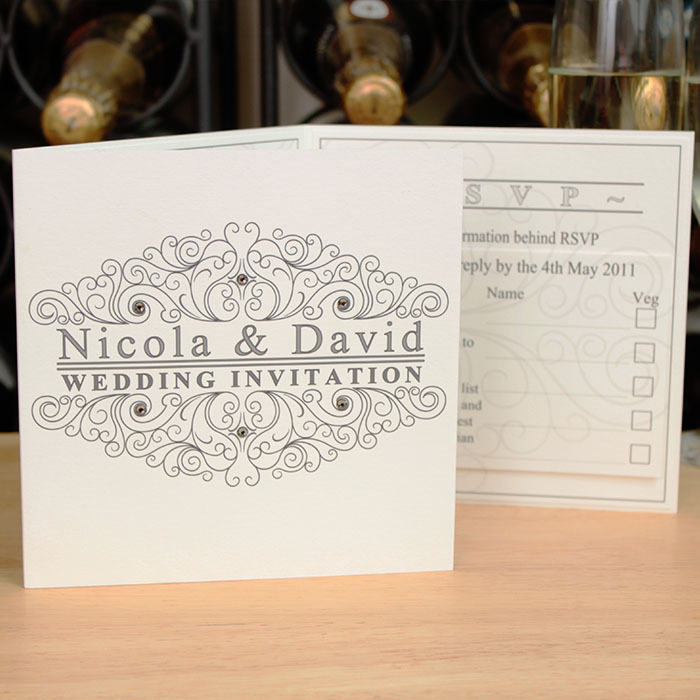 We are passionate about working closely with our clients and creating exceptional stationery for them. Wedding group shots that rock!